The Belchamp Morris Men recently presented a cheque for £200 to Kernos, the result of donations received from their dance displays at various local venues during the summer. 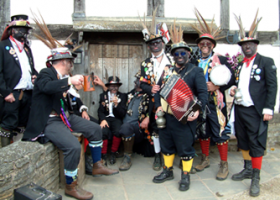 Founded in 1976, the Belchamp Morris Men take their name from the village of Belchamp St Paul in North Essex. Originally formed to dance Morris in the Cotswold style, they decided in 1990 to convert to the dances and style of the Welsh Border Counties, dancing in tailcoats, bowler hats and with blackened faces, for anonymity. Kernos Clinical Director Chris Boatwright said: “We are very grateful for this kind and generous donation, and we will take steps to ensure it directly supports the unfunded, disadvantaged clients from our local community”. Donations received during the past month have also included £200 from Clare Town Council and £200 from a funeral collection, both of which have been gratefully acknowledged.